Is it possible to perform other procedures at the same time? These operations involve the removal of redundant eyelid skin and fat which may obscure vision. These operations involve the removal of redundant eyelid skin and fat which may obscure vision. Furthermore surgery to the lower lid consists of tightening of any excess or lax skin. This results in producing a more youthful appearance to the upper and lower eyelid. The aim of “freshening” the tired eye look. Contouring of the skin to the upper and lower eyelid will also produce a more youthful appearance to the lower forehead and brow region as well as to the cheek and malar (cheekbone) region. This consists of removal of a crescent of skin and the underlying fat from the upper eyelid. The incision is planned so that the final scar will fall into the natural skin crease (supratarsal crease) that classically lies 10mm above the lash line. Patients will also have excess fat removed from the fat pads of the upper eyelid if required. The skin is incised and lifted away from the underlying muscle to allow excess fat to be removed. At the same time a muscular sling can be used to resuspend the eyelid. A canthoplasty may also be performed which involves tightening of the outer corner of the eye, strengthening the lower eyelid tone. This produces a more youthful appearance to both the lower eyelid as well as the upper cheek region which can reverse many of the changes of ageing. It is possible to perform multiple other procedures at the same time as a blepharoplasty. Classically other facial rejuvenation procedures such as a facelift, brow lift or fillers. It is also possible to perform upper and lower eyelid blepharoplasties independently or as a combined procedure. The specific risks related to the surgery include thickening of the scar particularly on the outer corner of the eye, scarring of the cornea, inability to fully close the upper eyelid (lagophthalmos), diplopia (double vision – very rare), dry eye problems, eyelash hair loss, ectropion (eyelid being pulled down) and in extremely rare circumstances blindness has been described. General risks include bruising, swelling, bleeding, wound infection and problems associated with the anaesthetic. Post operatively you will be observed in hospital for a few hours where ice packs will be placed on your eyes to minimise the bruising. Some significant bruising and swelling may occur. This may take up to a few weeks to resolve. Occasionally stitches will be placed which need to be removed at five days. 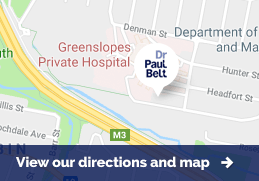 You will be seen regularly in the post operative course by both Dr Belt and the Practice Nurse who will check upon you daily. These include Dr Belt’s fee, the theatre fee and day fee. Generally most patients have this procedure performed as a day case. In addition, an anaesthetist fee is required for patients having a General Anaesthetic. Some fees may attract rebates from Medicare and Health Funds. Please contact Dr Belt’s rooms for a more specific quote. Dr Belt recommends that upper eyelid surgery can be performed either under a Local Anaesthetic or a General Anaesthetic depending on the patient’s preference. Dr Belt recommends that lower eyelid surgery is performed under a General Anaesthetic undertaken by a specialist consultant anaesthetist.